Bees, wasps, and other common flying insects that sting are active throughout the year, but they cause the most problems for humans in the late summer and fall, when they are in scavenging mode. While your first reactions to these insects might be fear or a desire to exterminate them, there is a better way to deal with them. Such insects provide crucial benefits to the environment, so killing them isn’t always the best response, and the attempt could put you in danger. Nests that are located in a place that poses a threat to people or animals should be dealt with carefully by trained professionals. Bees, wasps, and hornets are attracted to sweet, flowery scents. Caution is highly recommended for any interaction with these insects, as their stings are painful and can be very dangerous to people who are allergic to them. To avoid attracting these insects to yourself, wear light-colored clothing. Dark colors may make you look like a natural enemy, while bright colors mimic the flowers they are seeking. Use unscented types of soap and other grooming products, as you do not want to have either a sweet smell or body odor that may make the insects think you are a natural predator, such as a skunk or a bear. 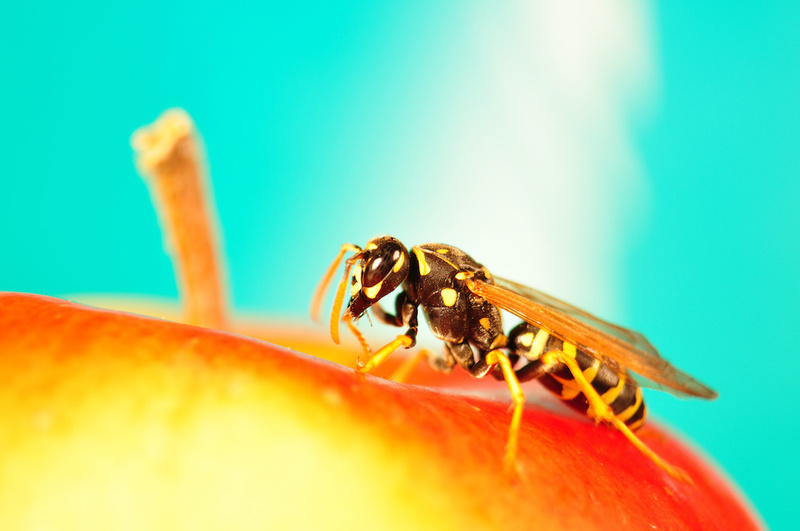 Wasps and hornets are more aggressive than bees, but any of them might try to sting under certain circumstances. Keep an eye out for bee hives and wasps’ nests. They will attack if their nests are disturbed. Sudden movements and noise may be seen as aggressive, so if you see a bee or wasp, remain calm and walk away from the area. Let’s learn a little more about the flying, stinging insects you might encounter. Bees have rounded, fuzzy bodies. Bumblebees are large, while honeybees are smaller. They build waxy hives, usually in shaded areas. Most bees are not aggressive and simply want to find sweet nectar. Bees, particularly honeybees, play a crucial role in maintaining the balance of the environment by pollinating flowers. A professional can safely remove and relocate a bee hive without killing the bees, and will know how to clean the affected area afterward. This way, bees are not attracted to any residue in that spot, which might make them decide to build another hive there. Unlike bees, wasps have thin, smooth bodies. Some wasps have yellow and black bodies (such as yellow jackets), while others (such as paper wasps) are brown and red. Wasps are predators that hunt other insects, playing an important role in managing the insect population in their area. Some construct papery nests, often in shaded areas, like under a tree branch or the eaves of a building, while others build nests in patches of dirt on the ground. Wasps are more aggressive than bees and will attack if they feel threatened. If injured or attacked, wasps give off a pheromone that alerts other wasps in the area to come and help defend against the danger. If you crush or agitate a wasp, be on the lookout for more wasps headed your way, because it may have called for backup. Hornets are a type of wasp, but they are much larger than most other wasps. The type of hornets found in North America are known as European hornets. They construct large, papery nests and prefer to build them in dark places, such as inside a hollow tree. Like other wasps, hornets are predators that help control the overall insect population. Hornets’ increased size means their stings are more painful and more dangerous than that of other varieties of wasps. Hornets also are very aggressive and can sting multiple times, so they pose an even greater threat and should be avoided completely. If you have a flying insect infestation on your property, you should not try to remove it yourself. Disturbing a nest threatens its inhabitants and you could be attacked by a swarm of bees or wasps, so it is best to leave that job to properly trained and equipped professionals. Contact Adios Pest Control today to find out how we can help remove flying insect infestations safely!